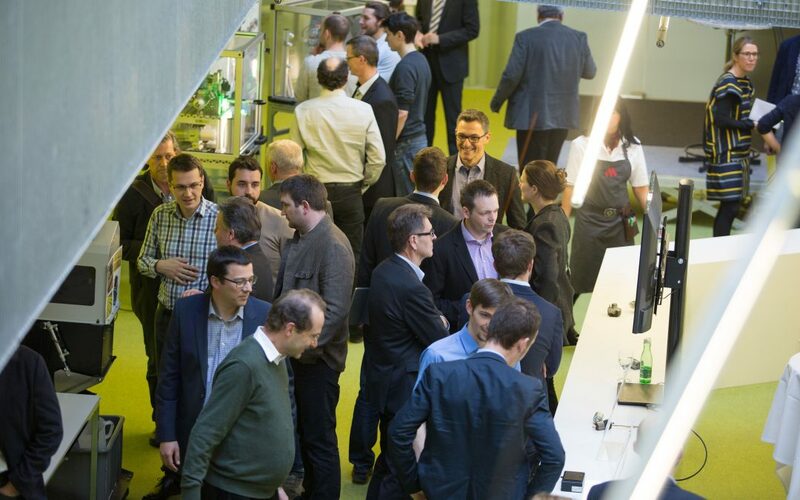 Virtual models, smart materials and the movements of cows’ ear were some of the topics at the LCM in-house exhibition that was held on March 2nd, 2017. International partners and clients set off on a fascinating journey into the future of mechatronics. The strength of LCM is in packaging new technologies from a wide variety of different specialist fields together into complete solutions. In this connection, science and business work together in a consolidated way. The motto of this year’s in-house exhibition was “Meta-Tronics”. 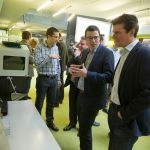 Because trends like increased digitisation, Industry 4.0 or the Factory of the Future, for example create completely new business models that are based on applied mechatronics. 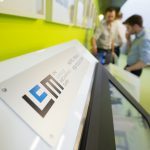 During a tour of the different LCM research areas, visitors to the in-house exhibition got up close and personal with individual areas of expertise. Virtual model and adaptronics experts as well as smart automation and intelligent material specialists answered the questions of the invited guests and were able to demonstrate the resulting economic potential in concrete terms. Another highlight of the 2017 LCM in-house exhibition was the keynote speeches about exciting technological trends for the future: Univ. Prof. Dr. Christiane Luible-Bär of Kunstuniversität Linz (University of Art and Design Linz), for example, spoke about the ever diminishing borders between objects and technical systems using Responsive Fashion as an example and demonstrated a vision for the future in which wearables are used for innovative means of diagnosis , therapy and prevention in healthcare. DI Dr. Bernhard Bergmair and DI Dr. Hubert Mitterhofer of the LCM covered the wide range of mechatronics in their contributions: digital valves, bearingless high-speed motors, simulation of processes and systems and smart measuring technology for industry were discussed just as much as concrete solutions in mechatronic research for end customers in the form of an innovative operating concept for touch systems with haptic feedback. The live demonstration on the topic of Indoor Localization was the absolute highlight of the event: This involved positioning a remote-controlled drone with centimeter precision in real-time before the eyes of the visitors. This technology has enormous potential: For example, it makes it possible to analyse the ear movements of cows in cowsheds to draw conclusions about their health and efficiency. In addition to the many and diverse practical references, the event focussed on the Comet K2 Division of the LCM: In the K2 centres, an ambitious research programme is being carried out at the highest level, which is defined jointly by scientific and business goals, with the aim of implementing optimum horizontal networking. Within the scope of the third Comet call for tender, applications were submitted for the planned “K2 Centre for Symbiotic Mechatronics” in which 44 company partners and 90 scientific ones are involved. The hearings for funding of more than 48 million Euro will be held in the middle of the year. A decision is likely in May of this year. 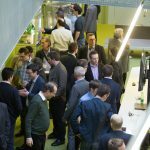 At the final networking sessions, people were able to go into more detail on a range of ideas and options at an informal get-together. Conclusion of the event: The interaction between research and development and economic success has never been greater. 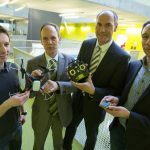 And Linz Center of Mechatronics GmbH is the first company to contact to accompany the innovation chain from your initial research activities all the way through to series production of a marketable product. Thank you to all visitors, exhibitor, lecturer, organizer etc for this great event.